Shamans, those exotic high priests of the isolated wilderness who command trance-level consciousness, have become increasingly popular in New Age spiritual quests. In the US, ancient shamanism is also receiving more and more scholarly attention at the same time that contemporary shamans are finding their own followings. 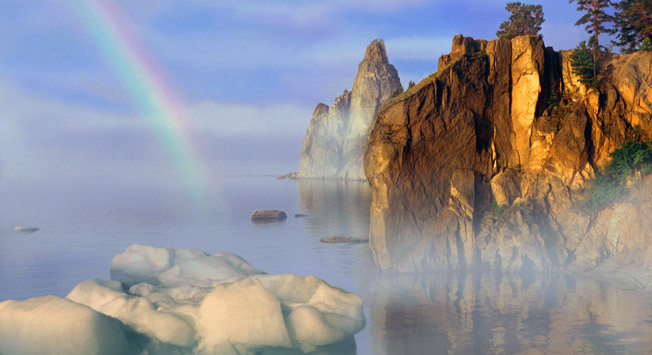 The sacred center of the shamans in the Northern Hemisphere is Olkhon Island in Lake Baikal. Due to its almost perfect isolation, Olkhon was the last stronghold of the North Asian shamans. It was a refuge for the Mongolian shamans hiding from persecution in the time of Genghis Khan, and later for the Buryat shamans when Buddhism spread in Buryatia. Traditional rites are still performed on Lake Baikal to this day. At the source of the Angara River is the rather small Shaman Stone—but one that would strand a boat in a second. Its base is covered with coins. In ancient times, local people believed the Shaman Stone possessed miraculous powers. It was here that they performed rituals and sacrifices. It was where they gave oaths to reveal false accusations or defend their honor: A person suspected of committing a crime was left overnight on the rock. If he had not died from the cold or drowned by morning, all accusations were dropped. Cape Ryty is located on the western shore of Lake Baikal. This mysterious place is sacred to the nearby inhabitants and a difficult destination for tourists. No vegetation grows here and no one lives in this exact place. The road ends, and there is not even a trail along the shore. Locals try to avoid Cape Ryty, often calling it a cursed place. However it is considered both a sacred and a paranormal place where glowing balls and lights have been reported. The cape is located on the Baikal-Lena Reserve, and tourists need special permission from local Baikal authorities to go ashore here. Cape Khoboy (in Buryat, khoboy means a canine tooth) is the most northern cape on Olkhon Island. The rock looks like a sharp fang, and when viewed from the lake, it resembles woman’s figure, like those that were once carved on the external bows of Greek galley ships. Locals call the rock Deva (The Young Woman). According to Buryat legend, Tengri (Baikal shamans) turned a jealous woman into stone who had asked them to give her a palace just like her husband's. Cape Khoboy has become a popular place for meditation. The place produces remarkable, multiple echoes that bounce off the rock. When exploring the caves in the winter, one can view amazing ice formations and transparent icicles. In the cliffs at water level, there are caves up to 22 meters (or 72 feet) long. Shaman Rock is one of the most mysterious of the Baikal sites. It is on Cape Burkhan, earlier called the "Stone Temple." It is comprised of white marble, granite and quartz. The first explorers to reach Lake Baikal – including the Russian scientist Vladimir Obruchev – noted that Baikal Buryats traditionally feared this site. Only shamans had the right to approach this forbidden place. If it couldn't be avoided, horses' hoofs were wrapped in felt and leather so they did not disturb the lord of Baikal. Buryats believed that Azhin (Buryat for deity), the lord of Lake Baikal, lived in the cave at Shaman Rock. According to the testimony of villagers who lived at Khunzhir, located near Cape Burkhan, the cave was visited by shamans that settled in ancient Siberia. Pagan priests still perform rituals in the cave associated with cleansing ancestral karma and removing curses. Cape Bogatyr is fascinating for shamans. It is a cape of Olkhon. The traditional name of the cape is Ogneny (fire). The first Russian explorers who sailed to the island at the end of the 16th century suddenly saw a huge column of fire shoot up in front of them from the waters of Baikal into the sky. The wall of fire appeared to be there to prevent strangers from stepping on the sacred ground of the island. Buryat shamans perform rituals here associated with conjuring the elemental forces of fire, wind and water. Through the first two decades of the 20th century, the elders of the local tribes brought newborn male infants to the cape. It was believed that once a boy had visited this place, the future leader or warrior would acquire special spiritual strength and longevity. Alkhanai Mountain (1,665 m) is one of the Buryat Buddhist shrines. The Temple of Great Benefit is located at its base. Nearby is a natural grotto along which a deep fissure cleaves deeply into the rock. The water that flows out of the rock is thought to have the power to cure disease. Astrological calculations conducted by Buddhist monks demonstrate that this peak is a portal to the middle world, where people live in the presence of the Almighty, and where the gods dwell. The most important protector of the highest point of Alkanai is the deity Demchog – one of the five great Buddhas, whose name in Tibetan means eternal blessing. Since ancient times, Buryat tribes and Mongols have ascribed powers to these places. There are 12 shrines located on Alkhanai. The most revered of them is Uuden Sume (Temple of the Gate). This natural arch in the rock is considered to be a portal that connects our world with Shambhala. Under the arch is a suburghan, a small Buddhist stupa, built in 1864. Byk Mountain is located north of the Irkut River, at the western tip of Lake Baikal. It is connected with the cult of the sacred ancestor of the Buryat people, Bukh Noyon, who was an earthly deity and the patron saint of pastures and livestock. Shamanistic and Buddhist rites are performed here by Buryats who live west of the lake. On the right bank of the river Angi just two kilometers (1.2 miles) from Lake Baikal, the Ekhe Yordo mound rises above. It seems that it couldn't be a natural formation, although geologists have not found any indication that the plates that make up the mound were brought here by people. After a 100-year break, the Yordyn Games Spring Festival of Indigenous Peoples of Baikal was finally reintroduced. Since then, the festival has been held here every four years. A main event at the games is a circular dance around the Ekhe-Yordo (Big Hill) that is a kind of marathon taking several days to complete. It takes 700 people to completely encircle the hill, and the festival has 2,000 to 3,000 visitors. The games take place over several days, and the sacred dance around the great hill continues day and night. During the festival, dancers wear out several pairs of shoes. During the festival only shamans are allowed to climb to the top of the hill. Most sacred places on Baikal are located on legendary Olkhon Island, which is a site for pilgrimage for tourists from around the world. Cape Khoboy, Shaman Rock, Cape Bogatyr and Mount Jima are all located here. On the way to Olkhon Island you can visit the sacred Ekhe-Yordo. By car: along Kachug route from Irkutsk through Oyok, Ust-Orda, Bayanday, Kosaya Steppe, Elantsy, Sakhyurte. From the ferry terminal in Sakhyurte it is 250 km along a paved road. Ferry service operates daily from 7.30 am to 10 pm every 30 minutes from May through October. By bus: From May to October a shuttle bus goes to Khuzhir (Olkhon Island) via ferry. It departs from Irkutsk daily at 10 am from the bus station (11 Oktyabrskaya Revolution street, Avtovokzal stop, tram number 4). It takes about 8 hours. In the opposite direction the bus leaves Khuzhir at 8.45 am. By water: You can reach Khuzhir from Irkutsk on the Barguzin. It departs in the summer (starting mid-June) daily at 9 am from Raketa pier in the suburb of Solnechny (Raketa stop, bus no. 16). It takes about 6 hours. Byk Mountain sacred site is situated in the picturesque Tunkin valley near Tora village. It is about 180 km from Irkutsk. The foot of the mountain can be reached by car, and the climb from there should take no more than one and a half hours. The most popular and well-known tourist spot is Shaman Stone, located near the source of the Angara near Listvyanka village.